Oxford is the perfect location to enjoy your stag or hen weekend with great variety of nightlife and exceptional restaurants it has everything you could need. Oxford is full of history and culture with world famous Universities and city buildings. Our activity site is located 15 minutes from oxford city centre and easily accessible from any direction. The Max Events site is situated at Grove Lane Farm and offers a variety of activities including Hovercraft, Quads, Clay pigeon shooting and Paintball. We understand the importance of having a great time at an affordable price to make your mate's last weekend of freedom a memorable one. This is proven by the fact that we are one of the main suppliers to the stag and hen agents around the country. With all our activities and paintball available at one site, just a short moment from Bournemouth centre, you won't have to go anywhere else. We offer the best of both worlds, new for 2005 with both woodland and open terrain scenarios. With more games to shake a stick at, friendly and experienced staff and the latest gear, we provide entertainment for all players from novice, to professional. 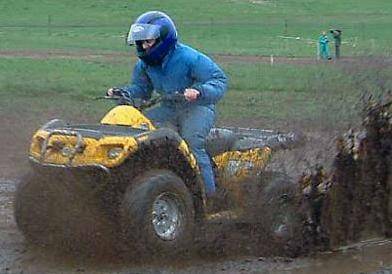 We use Bombardier 175cc quads that are larger than the market norm. Although we can safely restrict the speed and they are still automatic, making them safe to drive, this also makes them easy to get used to and have fun with. 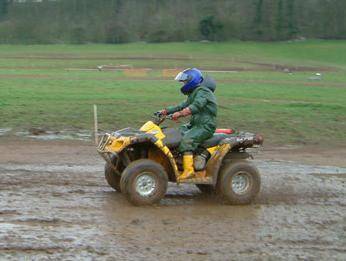 Normally we operate the quads around a skills course, or time trial basis two vehicles on any event. With go-karting you would normally hit the brakes or slid around a corner, not so with our hovercrafts - you don't have any brakes!! Hovercrafts - do you drive them, pilot them, ride them or fly them? We've got no idea what the official term is, but one thing we are sure of is that they are great fun and like nothing else you've ever tried to drive (or fly, or ride..!). The adrenalin will flow as you squeeze the throttle and twist your body to throw these lightweight, 600cc machines around the corners. Run as either a head to head competition, team relay event or simply a timed competition. Enjoy the experience of real shooting with a variety of "birds" available. This event really is a taste of the outdoors. With CPSA qualified instructors to help you, feel the satisfaction of seeing those clays explode! (hopefully!). This energetic activity is a game of two halves set over a landscaped course specially designed to include a water hazard. One team will be kitted out with overalls and masks and must run through the course amid a barrage of paintballs to achieve the highest score possible. The second team are strategically positioned and armed with catapults and paint and must hit the opposing team to slow them down. But remember not to get too carried away because the teams will then swap and revenge can be gained.